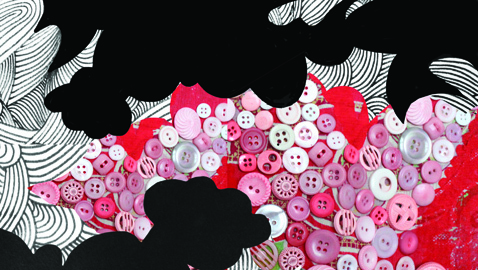 This weekend’s senior Studio Art exhibition features the work of Miyuki Baker ’12. Her artwork will be displayed in List Gallery from May 17th to the 20th. The opening reception is Thursday the 17th from 4:00 to 6:00 p.m.
Baker is an artist from Newton, Massachusetts. Her work centers on her various identities, including (but not limited to): queer, Japanese, Hapa, environmentalist, and feminist. For Baker, each identity suggests particular imagery and narratives, and she blends different mediums and everyday objects to explore her conception of self. Her senior exhibition is a culmination of the different kinds of artworks she has created during her five-year journey at Swarthmore. “[The show] represents a beginning of a lifelong art-making project in which I continue to re-script my histories and my art,” said Baker. Baker acknowledges that in both her life and her artwork, she ignores the distinction between private and public identities, often surprising strangers with “personal” information. Her intention is to challenge assumptions and encourage others to be comfortable with both visible (race) and invisible (queerness) identities. The exhibition draws a strong connection between identities and clothing, emphasizing the ways in which people “wear” different identities. The gallery is filled with Baker’s handmade kimonos. Baker also chose to create kimonos because of what she feels they symbolize in Western media. The show also includes a “ceramic kimono,” which explores the notion of the kimono as a container for the body. The piece, as well as the many others in the gallery, plays with color and “the language of bodies”: through grooves, holes, and piercings, Baker mimics hiccuping, bleeding, shaving, pregnancy, crying, and other ways in which the body undergoes change. The artworks in the space are covered with buttons, bottle caps, plastic bags, sumi ink, doilies, lace, and yarn. The installation leads visitors through Baker’s creative process, beginning with layers of hanging objects and carefully burned sheets and leading to the fabric kimonos and finally the large ceramic pieces.